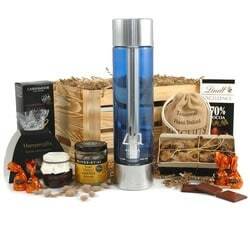 Our Premium Vodka Hampers and Crates are fantastic gifts and ideal for the distinguished distiller in your life, accompanied with a tasty selection of snacks. 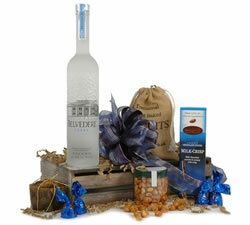 Belvedere Vodka - Belvedere is a Polish rye vodka, introduced into the market in 1993. It's quadruple distilled and free of additives creating a perfect balance of character and purity. Perfect on the rocks, in a martini or breathing life into a cocktail. Crystal Head Vodka - Crystal Head Vodka is a brand co-owned by our favourite ghost busting hero, Dan Aykroyd. The vodka is made from high quality peaches and cream corn, quadruple-distilled and then filtered seven times. The final three filtrations are through Herkimer diamond crystals. Oh and did we mention the awesome bottle? DQ Vodka - DQ Vodka is a premium Swedish vodka manufactured from Sweden's magical winter wheat. It's continuously distilled into one of the smoothest vodkas you'll ever taste and then packaged into a stunning glass and metal bottle, with satin chrome caps. If you care about the environment, you'll be delighted to know that DQ Vodka is a 100% carbon neutral product. 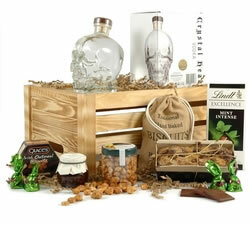 Each of the vodkas above is packaged with a selection of tasty snacks and treats and presented in a beautiful crate, ready for your loved one to enjoy. Just make sure you screw the lid back on tightly to hide the little taste you had before presenting it to them!